Sensitive skin of the child. Solar intolerances. Very high UVA / UVB protection, wide and photostable. 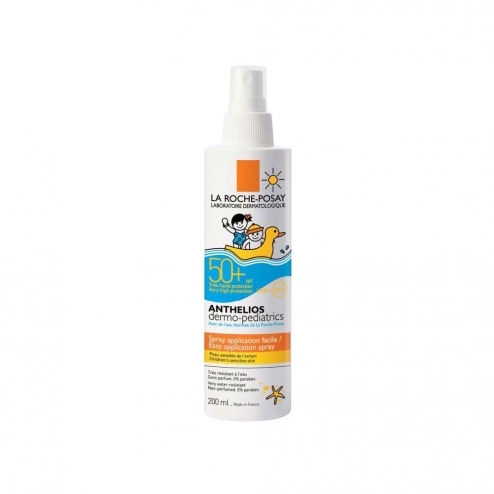 Optimum protection SPF 50+ reinforced against UVA (level stricter than the European recommendation) thanks to a new Mexoplex patented filtering system associated with La Roche-Posay thermal water, soothing and antioxidant. In a new, more minimalist formulation tested under dermatological control: fragrance-free, paraben-free, lightened in chemical filters, nickel tested (guarantee of a nickel level below the threshold triggering allergic reactions in sensitized subjects). My UV Patch is the first UV sensor to wear on the skin. It allows to measure in real time, the doses of UVA and UVB instantaneous and accumulated over several hours and several days. Connected to smartphones via the My UV Patch application available on Android and iOS, it was developed by LRP to help consumers adopt the right sun protection gestures. Apply the product just before exposure. Renew generously and frequently, especially after bathing or wiping. Do not expose children under 3 years of age. Glycerin, Propylene glycol, Ethylhexyl salicylate, Alcohol denat., Styrene / acrylates copolymer, Bis-ethylhexyloxyphenol methoxyphenyl triazine, Drometrizole trisiloxane, Butyl methoxydibenzoylmethane, Ethylhexyl triazone, Polyester-5, Acrylates Copolymer, Caprylyl glycol, Disodium edta, Ethylenediamine / stearyl dimer dilinoleate copolymer, Isopropyl lauroyl sarcosinate, Peg-8 laurate, Terephthalylidene dicamphor sulfonic acid, Tocopherol, Triethanolamine. Without paraben. The list of ingredients may be subject to variations, so we advise you to always check the list on the product purchased.